This unique book, the first published on the subject, provides an introduction to the theory of macrotransport processes, a comprehensive effective-medium theory of transport phenomena in heterogeneous systems. The text begins with a relatively simple approach to the basic theory before turning to a more formal theoretical treatment which is extended in scope in each successive chapter. Many detailed examples, as well as questions appearing at the end of each chapter, are included to demonstrate the practical implementation of the theory. 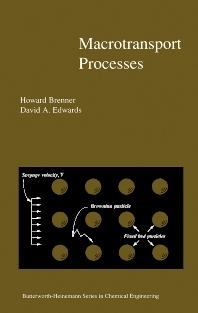 Introduction to Macrotransport processes; Unidirectional dispersion of a nonreactive solute; Dispersion of nonreactive solutes in continuous media; Dispersion of nonreactive solutes in discontinuous media; Surface and interfacial transport process; Time periodic process; Direct hydrodynamic coupling; Chemically reactive systems; Examples of dispersion analyses for spatially periodic systems; Energy dispersion; Momentum dispersion; Derivation of the Smoluchowski equation via macrotransport theory; The langevin approach to macrotransport processes.